What is Cash Management Group in Vendor Master Creation? I Need your help on Vendor Master Creation. It is asking about Cash Management group. This Cash management captures the unpaid invoices along with their due dates and will help the management in projecting how much money is owed to all vendors today, tomorrow and so on it helps in knowing payment commitments and it helps in managing funds. Say today we have 100000 in our bank, tomorrow 20000 worth of vendor invoices fall due, by day after tomorrow 3000 and so on. In the same way CM also captures how much money owed by customers to us today, tomorrow and day after and so on.Today's cash balance i s added with today's in coming payments and deduct outgoing payments in this way we can project what will be our cash position in future dates this will help management in knowing cash position and liquidity management. 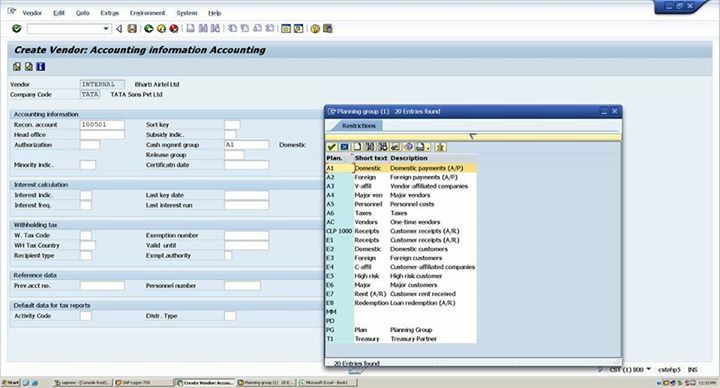 2.path;spro -ep structure -assignment-fi accounting-assign co.code to fm area ,save and see what next .